I Love Lucy is one of my favorite sitcoms. 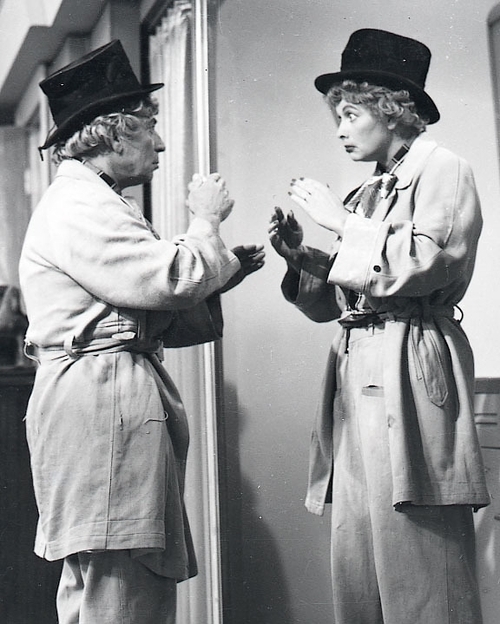 In season 4, episode #125 Lucy does a mirror act with Harpo Marx. This scene was hysterical! It also presents an idea for a great family activity opportunity. After watching this scene it is easy to see how fun it would be to play a pretend mirror image game. Any age, preschool and up, can enjoy this activity. First decide who will be the mirror and who will “look into” the mirror. After this has been decided, the person looking into the mirror makes various movements. Examples: right hand up, left hand up, smile, make a funny face, stick out your tongue, wave your right hand and then your left, turn your head to the left, then the right, slowly bring up your right knee, march in place, etc. The person playing the mirror must imitate the other person’s movements at the same time as they do them. How sharp are your observation skills? Can you keep up or are you always behind? Can you anticipate the next movement? Can you play without cracking up in laughter? How long can you play without giggling? This can be played with any willing person, in any place that allows loud bursts of fun and silliness. Have fun!